Tax season is a perfect time to look at how much money is coming in and give the household budget a checkup. This six-step process could help you take control of your money. Every year, nearly 130 million households file their federal tax returns.¹ For many, the process involves digging through shoe boxes or manila folders full of receipts; gathering mortgage, retirement, and investment account statements; and relying on computer software to take advantage of every tax break the code permits. Tax preparation may be the only time of year many households gather all their financial information in one place. That makes it a perfect time to take a critical look at how much money is coming in and where it's all going. In other words, give the household budget a checkup. One method for doing a thorough budget checkup involves six steps. Start by dividing expenses into useful categories. Some possibilities: home, auto, food, household, debt, clothes, pets, entertainment, and charity. Don't forget savings and investments. It also may be helpful to create subcategories. Housing, for example, can be divided into mortgage, taxes, insurance, utilities, and maintenance. Go through all the receipts and statements gathered to prepare taxes and get a better understanding of where the money went last year. Track everything. Be as specific as possible; and don't forget to account for the cost of a latte on the way to the office each day. Knowing how much was spent in each budget category can provide a useful template for projecting expenses moving forward. Go through category by category. Are expenses likely to rise in the coming year? If so, by how much? The results of this projection will form the basis of a budget for the coming year. Add together all sources of income. Make sure to use net income. It's time for the moment of truth. Subtract projected expenses from expected income. 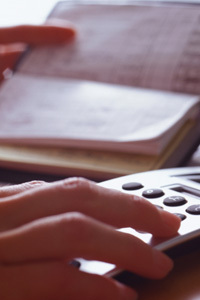 If expenses exceed income, it may be necessary to consider changes. Prioritize categories and look to reduce those with the lowest importance until the budget is balanced. If it's not in the budget, don't spend it. If it's an emergency, make adjustments elsewhere. Cash purchases don't show up on monthly statements, making them more difficult to track. Consider keeping receipts for all cash purchases. For smart phone users, an app may help you set and track your budget. The iTunes App Store and Google Play each list over 1,000 different budgeting apps. Apple App Store and Google Play, surveyed on February 13, 2013. Protective Life refers to Protective Life Insurance Company (PLICO) and its affiliates, including Protective Life & Annuity Insurance Company (PLAICO). FMG Suite is not an affiliate of PLICO and is responsible for its own financial conditions and obligations.